My friend Karyn’s husband and father have their birthdays on the same day but she didn’t really need two cakes in the house. 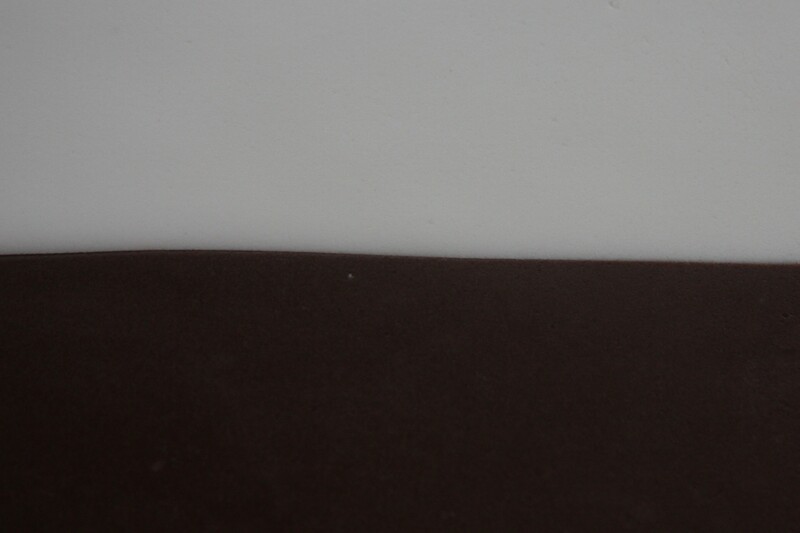 One cake was plenty but one of them prefers chocolate, the other vanilla. 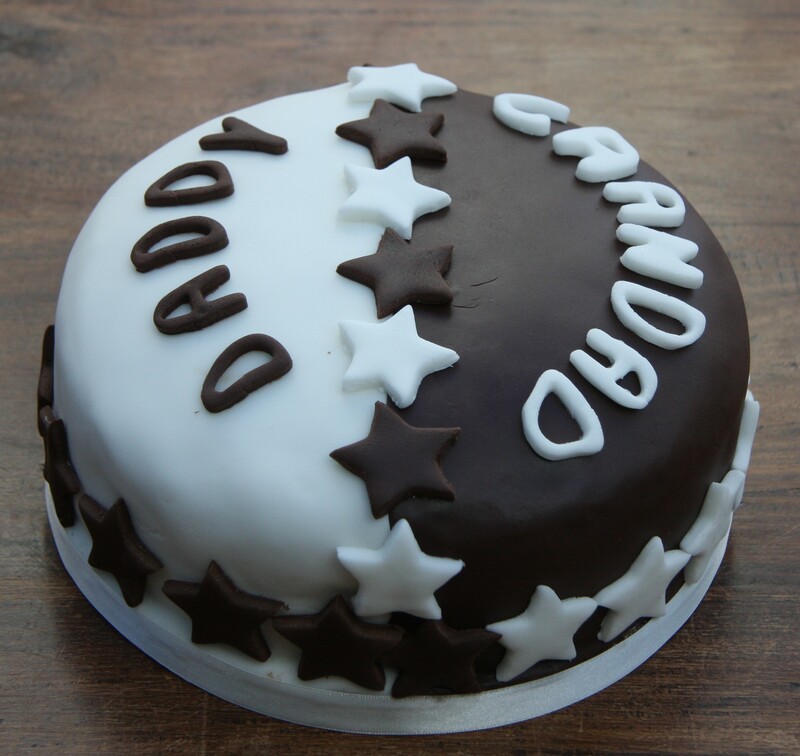 A problem easily solved by a half chocolate, half vanilla birthday cake! I had never made one of these before so this was a learning experience for me. I had originally thought I would use one colour of icing as that would help to hold the whole thing together. Then I realised that once I had iced it would be very difficult to know which bit belonged to whom and there was no guarantee I would get it right! I also thought it would be more striking in the two colours. I made one Victoria sponge mix and split it by weight into two bowls after adding the eggs. 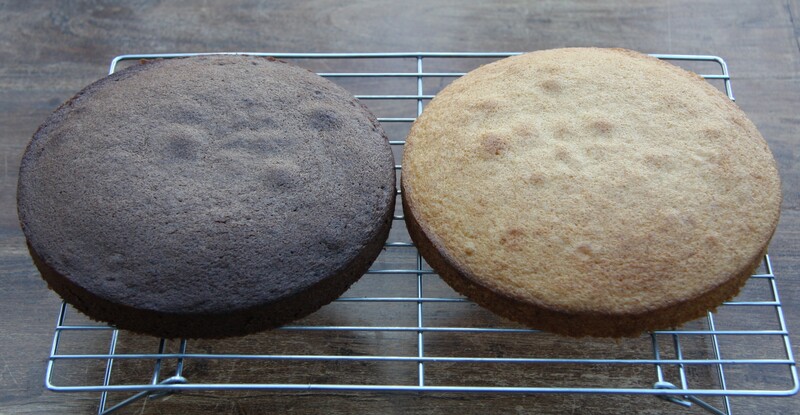 I then folded flour into one half and flour and cocoa powder into the other half. 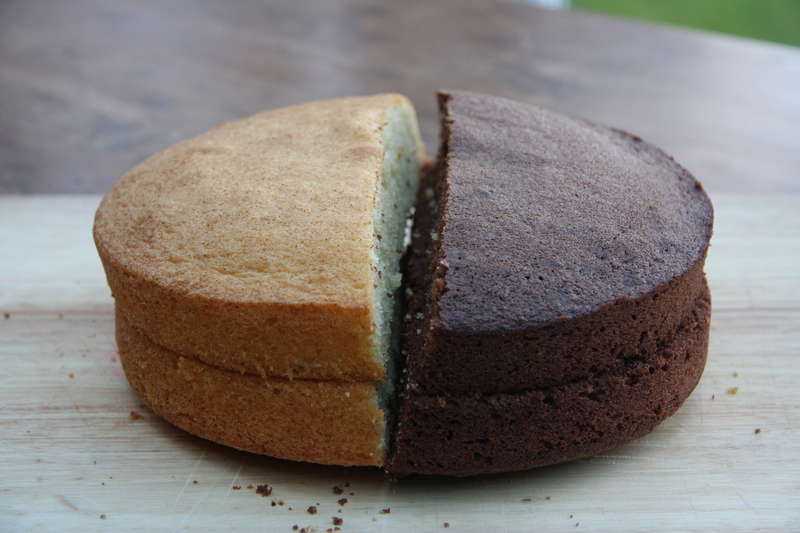 I wanted each half to be exactly the same to make sure that the centre of the cake was completely level thoughout. It wasn’t too easy to get onto the cake in one piece! I ended up with a tiny gap in some places across the centre and I was afraid the weight of the icing might widen it. So the stars across the middle are decorative but also serve as glue and hide the join! I wonder if each side of the cake had its own candles! You’re so clever and creative. I love it. What a wonderful idea. It’s a lovely cake and so creative. What a brilliant idea! So original! I can’t claim the idea unfortunately but it is a great one! But you did an awesome job! It’s a great idea isn’t it! Thanks very much. I was lucky in that the cakes were the same height, I just didn’t manage to cut them into two exact halves so I had one smaller and one larger piece of both chocolate and vanilla cake. They fitted together like a puzzle and at the time I was hoping it would strengthen the join! Great for twins who don’t want a whole cake each! It’s was beautiful and tasty as always:) yes they did have separate candles! Will find a photo and send to you. Thanks as always Rachel you are a star. You are more than welcome! Looking forward to seeing the candles! You’ve been decorating a lot of cakes recently! 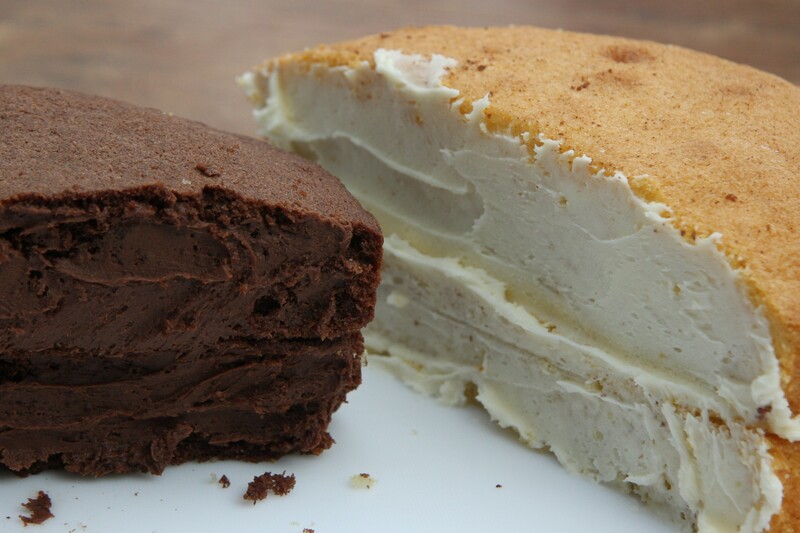 what a great idea to have two flavours in a cake and pleasing both parties. I think you did a terrific job with the sugar paste. 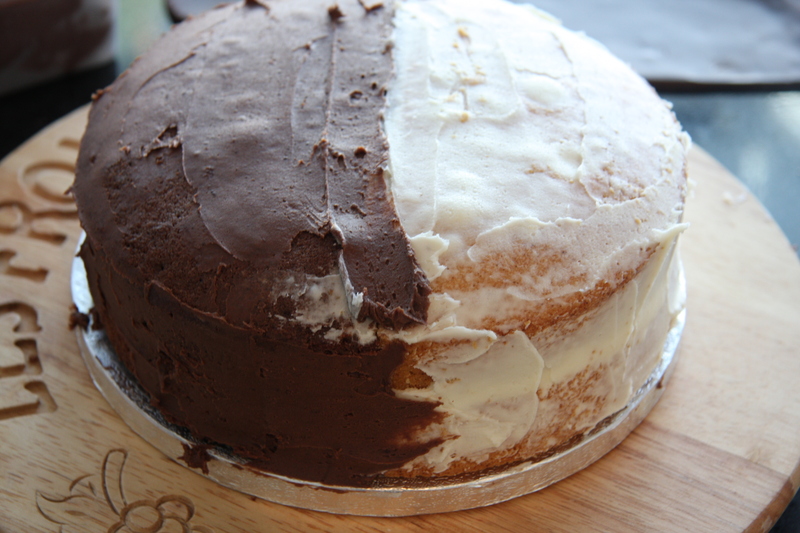 You can’t see the gap between the two cakes! 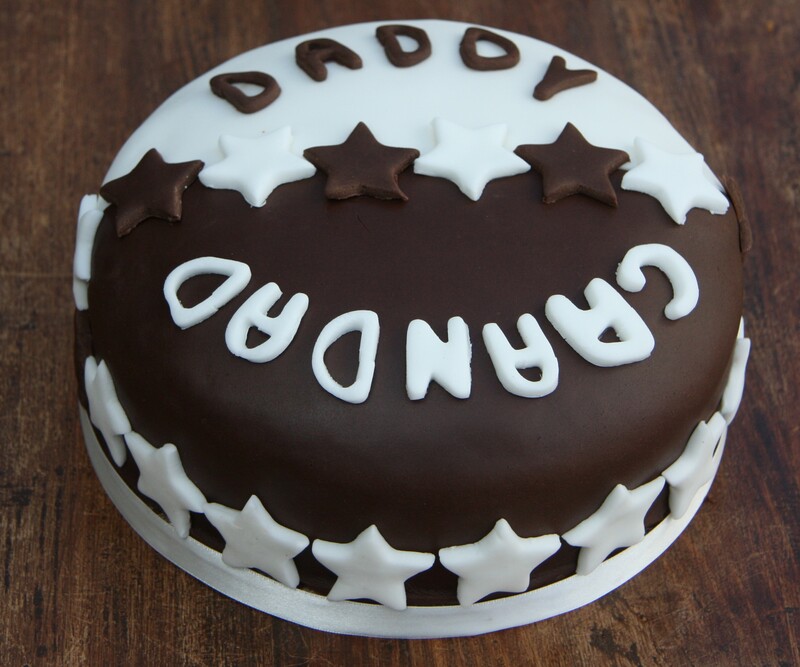 Thank you – it’s funny how these things go in phases, it had been ages since I had done a cake with sugarpaste and suddenly a few came along at the same time. Like buses! So clever, I love this!